With all due respect to belief and dogmas, there has been a fraternal life between Christians and Muslims. How much the Christians have shared here in our East specifically from the beginnings of Islam. They shared every sweet and bitter circumstance of life. The Arabic letter "n" (inside red circle), signifying "Nasarah" (Christian), on a Christian home in Mosul. 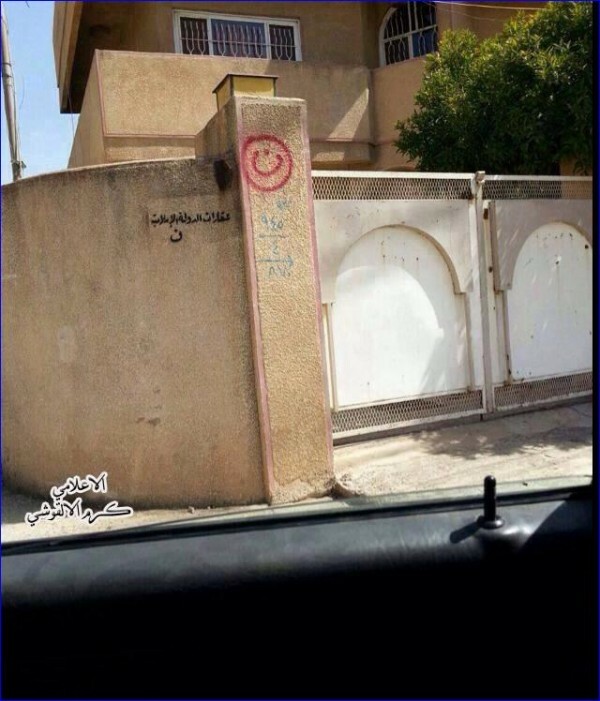 ISIS has also marked Shiite homes with the letter “r”, signifying “rwafidh” (rejecters). Chaldean Patriarch Louis Sako issued an urgent appeal in a letter on Thursday. The following is the full text of the letter. 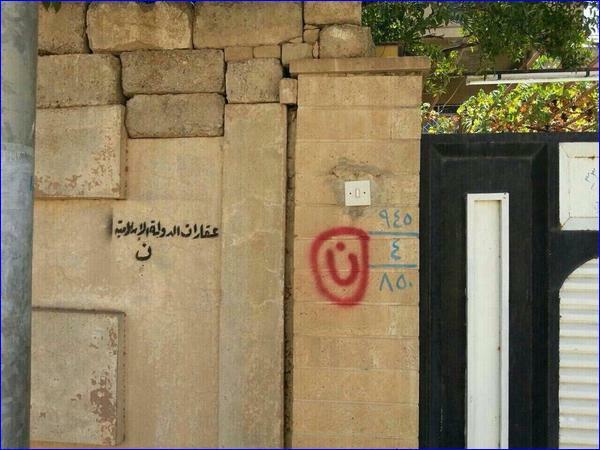 The Arabic letter “n” (inside red circle), signifying “Nasarah” (Christian), on a Christian home in Mosul. PEACE AND MERCY FROM GOD! The control exercised by the Islamist Jehadists upon the city of Mosul, and their proclamation of it as an Islamic State, after several days of calm and expectant watching of events, has now come to reflect negatively upon the Christian population of the city and its environs. The initial sign was in the kidnapping of the two nuns and 3 orphans who were released after 17 days. At the time, we experienced it as a flash of hope and as a clearing of the sky after the appearance of storm clouds. Suddenly we have been surprised by the more recent outcomes which are the proclamation of an Islamic state and the announcement calling all Christians and clearly asking them to convert to Islam or to pay the jizya (the tax all non- Muslims must pay while living in the land of Islam) — without specifying the exact amount. The only alternative is to abandon the city and their houses with only the clothes they are wearing, taking nothing else. Moreover, by Islamic law, upon their departure, their houses are no longer their properties but are instantly confiscated as property of the Islamic state. In recent days, there has been written the letter ‘N’ in Arabic on the front wall of Christian homes, signifying ‘Nazara’ (Christian), and on the front wall of Shiite homes, the letter ‘R’ signifying ‘Rwafidh’ (Protestants or rejecters). We do not know what will happen in future days because in an Islamic state the Al — sharia or Islamic code of law is powerful and has been interpreted to require the issuance of new I.Ds for the population based on religious or sectarian affiliation. This categorization based upon religion or sect afflicts the Muslims as well and contravenes the regulation of Islamic thought which is expressed in the Quran which says, “You have your religion and I have my religion” and yet another place in Quran states, “There is no compulsion in religion”. This is exactly the contradiction in the life and history of the Islamic world for more than 1400 years and in the co — existence with other different religions and nations in the East and in the West. With all due respect to belief and dogmas, there has been a fraternal life between Christians and Muslims. How much the Christians have shared here in our East specifically from the beginnings of Islam. They shared every sweet and bitter circumstance of life; Christian and Muslim blood has been mixed as it was shed in the defense of their rights and lands. Together they built a civilization, cities, and a heritage. It is truly unjust now to treat Christians by rejecting them and throwing them away, considering them as nothing. It is clear that the result of all this discrimination legally enforced will be the very dangerous elimination of the possibility of co — existence between majorities and minorities. It will be very harmful to Muslims themselves both in the near and the distant future. Should this direction continue to be pursued, Iraq will come face to face with human, civil, and historic catastrophe. We call with all the force available to us; we call to you fraternally, in a spirit of human brotherhood; we call to you urgently; we call to you impelled by risk and in spite of the risk. We implore in particular our Iraqi brothers asking them to reconsider and reflect upon the strategy they have adopted and demanding that they must respect innocent and weaponless people of all nationalities, religions, and sects. We call Christians in the region to act with reason and prudence and to consider and to plan everything in the best way possible. Let them understand what is planned for this region, to practice solidarity in love, to examine the realities together and so be able together to find the paths to build trust in themselves and in their neighbors. Let them stay close to their own Church and surround it; endure the time of trial and pray until the storm will be over.